What is a meat shield? 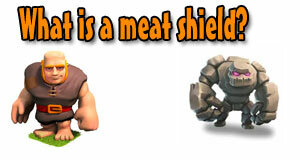 A meat shield is a strategy where you deploy high health troops like the giant, pekka or a golem first. The defenses will attack those high health troops, then deploy troops that do more damage but are weak like archers, barbarians or wizards to destroy the village while being safe. This technique is the most used one in clash of clans.